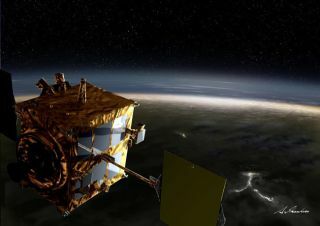 Japan's Venus Climate Orbiter "Akatsuki" will both the atmosphere and surface of Venus. A Japanese Venus probe fired its main engine Wednesday (Sept. 7) for the first time since overshooting the planet in December, paving the way for a possible comeback bid in 2015. The Akatsuki spacecraft was slated to enter orbit around Venus on Dec. 6. But its engine failed during a crucial orbit-insertion burn, and the probe went sailing off into space. But officials with the Japanese Aerospace Exploration Agency (JAXA) haven't given up on Akatsuki. They want the probe to take another shot at Venus during the next available opportunity, which could come as soon as 2015. So they've started testing the probe's main engine, called the "orbit maneuver engine." Wednesday's burn lasted two seconds, just as planned, JAXA officials said. Another test, this one lasting 20 seconds, is slated for next Wednesday (Sept. 14), they added. If all goes well with that one, Akatsuki will likely perform a real operational burn in November, the news agency AFP reported. That maneuver would help put the spacecraft on the right path to make its second attempt at Venus. The $300 million Akatsuki spacecraft (whose name means "Dawn" in Japanese) launched in May 2010 along with JAXA's Ikaros solar sail, which successfully deployed in deep space. Akatsuki was supposed to spend two years zipping around Venus, studying the hellishly hot planet's clouds, atmosphere and weather. One main goal was to determine how Venus — similar in so many ways to Earth — veered off on such an extreme path, becoming an inhospitable world with thick sulfuric-acid clouds and surface temperatures hot enough to melt lead, JAXA officials have said. Akatsuki was the second robotic Japanese probe ever dispatched to visit another planet. Japan's first planetary mission, the Nozomi orbiter sent to Mars, also failed to enter orbit in late 2003.